As the Russian rumors continue to fly, the Trump administration is likely to produce multiple nominees for best actor in a foreign production. When neither Comey nor McCabe accepted Priebus’s invitation to a future Leavenworth Prom, Priebus turned to the chairmen of the Senate and House intelligence committees, Senator Richard Burr (R-NC) and Representative Devin Nunes (R-CA). Both of these men, who are tasked with potentially investigating Trump’s Russian connections, cast any illusion of independent oversight aside and took up Trump’s cause by pushing back against the press on Russia. In last week’s edition, I mentioned that Trump’s personal attorney, Michael Cohen, along with Trump’s mafia-linked buddy, Felix Sater, had been secretly negotiating some sort of very Russian friendly Ukrainian-Russian peace plan. Since last week, Cohen has told four different storiesabout his involvement in the plan. He told The New York Times that he delivered the proposal to then National Security Adviser Michael Flynn’s office. He then told The Washington Post he didnot deliver it to Flynn or even discuss it with anyone in the White House. He then told Business Insider that he didn’t even know what the plan was. Then he changed his mind and told theBusiness Insider that he actually did remember that the plan was something about creating world peace. Stay tuned for story number five. . . In a sign that the public pressure may be starting to break through, big Trump backer, Representative Darrell Issa (R-CA) called for an independent prosecutor to look into Russian election tampering. In related news, Issa won re-election by 1 percentage point and Clinton won his district. John le Carré wouldn’t even believe this subplot, but these days anything is possible. In the past three months, i.e., the months after we elected a President with potentially deep ties inside of Russia, five Russian diplomats have died under mysterious circumstances. The latest is 64 year-old Russian UN Ambassador Vitaly Churkin. Churkin just so happens to be the Russian diplomat who arranged for Trump’s first visit to Russia in 1986. These are probably just all victims of Russia’s recent increase in mortality rate. However, if you’re hearing Layla and imagining a Goodfellas-like severing of all connections to the heist, I can’t blame you. The Trump Administration made easy for us this week. We no longer have to guess where they are going. They told us. “We’re getting really bad dudes out of this country, and at a rate that nobody’s ever seen before. And they’re the bad ones. And it’s a military operation.” [emphasis mine]. White House Sean Spicer said the Commander-in-Chief didn’t actually mean “military” as in the military, but as an adjective. Fool me once, Sean, but fool me a hundred times? In the words of George W. Bush, I won’t get fooled again. On February 24 the White House banned the following organizations from attending a press meeting with Sean Spicer: The Los Angeles Times, Politico, The New York Times, CNN, Buzz Feed, The Hill, BBC, and The Guardian. Jefferson Beauregard Sessions III worked his entire life to become the chief law enforcement officer of the most powerful nation in the world and this is how he spent his first days with that awesome power to help and to protect so many. In Trump’s defense, I’m sure he has no idea what LGBT stands for. Among those expressing dismay at the announcement was long-time Republican Caitlyn Jenner. Last April, Jenner met with Trump at Trump Tower in a big “look I’m secretly moderate” photo op in which Trump said people should use “whatever bathroom they feel appropriate.” Despite fierce competition, it looks like Jenner just became the most exploited woman in the Kardashian clan. Sorry, Kylie, maybe next year. Trump’s reasoning for taking away federal protection from trans students was that it should be up to each state to decide whether they want to defend some of the most vulnerable in our society. Threatening legalized marijuana – Speaking of states’ rights, they don’t exist if Sessions doesn’t agree with you and Sessions really doesn’t like marijuana. So in the same press conference in which Spicer said trans issues are states rights, he said, “I do believe you’ll see greater enforcement of [marijuana].” He then went on to compare marijuana to the opiate epidemic. I hope all the libertarian Gary Johnson voters are still really excited about their protest votes. Among those expressing dismay at the announcement was Republican Senator Cory Gardner from Colorado. Gardner claims that Sessions had told him that marijuana was not a priority. All of these poor Republicans are finally realizing that Trump and his associates are not the most trustworthy chaps. Allowing for more private prisons – Sessions reversed an Obama Administration order to phase out private prisons. Why did the Obama Administration phase them out? Because they are awful places with misaligned incentives. Why did Sessions reverse it? Because of “the future needs of the federal correctional system” (see: marijuana enforcement above) and the $745,000 donated to Trump by the for-profit prison industry in the last few months alone. 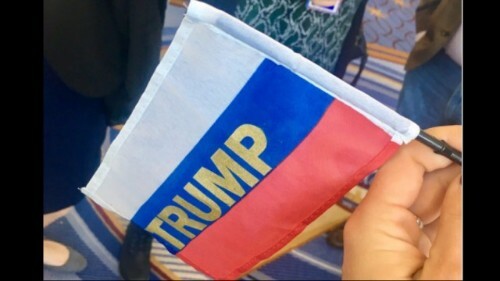 At the Conservative Political Action Conference, pranksters passed out Russian flags with Trump’s name on them before Trump’s speech. Attendees waived them proudly as they didn’t know or didn’t care – not sure which is worse. Trump is Creating Jobs! – Executive VP of the NRA and future resident of the seventh concentric circle of hell, Wayne LaPierre told the Conservative Political Action Conference that left wing demonstrators are being paid $1500 per week. I hope you got your check! Tony Soprano, Paulie Walnuts, and You with Your Cute Princess Leia Protest Sign – The Arizona Senate has voted to extend the meaning of “racketeering” (the law used often to take down the mob) to protesters. Anyone attending a rally that turns violent, even if they are not violent, would be subject to arrest and the government could seize their assets. Arizona Senators are using the lies about paid protesters to justify this law. This is similar to other attacks by Republicans across the country on the First Amendment right to peaceably assemble. Phew, That Was Close – This week, Trump’s revved up Customs and Borders Protections agents detained: Muhammad Ali Jr. – American citizen and son of Muhammad Ali, Mem Fox – a 70 year-old woman who is Australia’s best known children’s author, and Henry Rousso – renowned French scholar on Vichy France. They also denied entry to Oscar nominated Syrian cinematographer Khaled Khateeb. The night before the Khateeb decision, I imagine Trump was up late watching a movie and thought Khateeb was going to pull a reverse Argo on us. Beginning to Think That the GOP Doesn’t Actually Care About Emails – Oklahoma’s Attorney General’s office confirmed that new EPA chief deconstructor Scott Pruitt used a private email server for state business in his prior position in OK. Oh and just two weeks ago, he lied about that in his Senate hearing for the EPA. The “Lock him up! Lock him up!” chants from the Trump faithful are deafening. Silver Lining on a Very Dark Cloud – After a St. Louis Jewish cemetery was vandalized, Muslim community members raised $115,000 in just two days to help with the repair. Seriously, Another Anti-Semite? – For being “the least anti-Semitic person that you’ve ever seen”, Trump sure knows a lot of anti-Semites. It was reported this week that Senior Trump Aide Sebastian Gorka has significant ties to anti-Semitic groups and political parties in Hungary. “Get Out of My Country” – Two Indian nationals and one good Samaritan were shot in Kansas at a barby a man who said before opening fire, “Get out of my country.” No comment from Trump on this terrorist attack in the United States. Also, no comment from him on a Tampa mosque being set on fire two days ago, the second Florida mosque in the past six months. I have read depressing article after depressing article the past few months, but this one takes the cake. Yep, even more depressing than the one in a prior issue showing parallels between Hitler’s rise and Trump’s rise. In “A professor’s lesson: ‘American democracy is now confronting an abyss”, Professor Michael J. Glennon of Tufts is afraid we’re waking up too late to stop the end of American democracy. I’m going to go read a story about a starving polar bear on an ice drift to pick me up. Trump will give a speech before Congress this Tuesday. As he details his latest horrific plans, we’ll see literally who will stand with Trump and who will sit in opposition. Take note and get ready to fight those who stand with Trump. Previous Post:Vol. 14 – Day 103 P.E. Next Post:Vol. 16 – Day 116 P.E.